Ethylene is the by far most important raw material in the petrochemical industry. About 130 million tonnes of ethylene were processed worldwide in 2013. Direct applications include, among others, the three polyethylene plastics high-density polyethylene (HDPE), linear low density polyethylene (LLDPE), and low-density polyethylene (LDPE) as well as petrochemical intermediates, which are in turn mainly used for the production of plastics. The most important of these are ethylene oxide, ethylene dichloride and ethylbenzene. With this current market study, Ceresana offers transparency regarding the development of the entire global market for ethylene and ethylene-derived products. It analyses important recent influential factors in detail, for example the consequences of the shale gas boom in the USA. Forecast cover the years up until 2021. This market report also covers all relevant data and facts regarding the ethylene market trends, market size and market growth. The shale gas boom in the US has considerable influence on the future development of the global market for ethylene: The strong decline of prices for ethane has led to a number of new ethane crackers being built. In contrast to other feedstocks such as naphtha or propane, the cracking of ethane yields a rather high amount of ethylene. This is of consequence for the global market: Several European manufacturers have announced to either close their crackers or to change over to using imported ethane as feedstock. Should the current downward slide of oil prices continue, however, the US fracking industry might lose its foothold; Ceresana analyses the long-term implications. Right now China not only imports large amounts of ethylene, but also increasingly high-density polyethylene (HDPE), linear low density polyethylene (LLDPE), and low-density polyethylene (LDPE). Many producers of ethylene and polyethylene (PE) are dependent on these exports to China. The Chinese government, however, is trying to significantly increase self-sufficiency in regard to ethylene and its downstream derivatives. In addition to a rising number of naphtha crackers, the use of coal in the production of olefins is supposed to be stepped up. In accordance with current developments on the world market, Ceresana forecasts revenues generated with ethylene on the global market to increase by 3.2% p.a. between 2013 and 2021 and thus at much lower rates than it had in the previous eight years. According to our analyses, this development goes in line with the fact that the partly resource fuelled, massive increase of production capacity will proceed faster than the increase of demand. Consequently, capacity utilization is likely to fall, which has a negative influence on price development. The polyethylene industry will continue to consume the majority of all ethylene produced. Depending on density and rigidity of the product, polyethylene is classified as either high-density polyethylene (HDPE), linear low density polyethylene (LLDPE), and low-density polyethylene (LDPE). In 2013, about 63% of global demand for ethylene was accounted for by producers of these plastics. While demand for LDPE is anticipated to increase only moderately, we forecast high growth rates for the products HDPE and LLDPE. Asia-Pacific and the Middle East in particular are expected to notably increase capacity in the near future. Another application area of huge growth potential is the production of ethylene oxide. Ethylene oxide is mainly used to produce ethylene glycol which is a pre-product for polyester. The production of textile fibers is growing significantly, especially in Asia. In addition, producers of ethylene oxide have already been able to profit from the worldwide growing substitution of glass by PET bottles and containers. We forecast global demand for ethylene in the production of ethylene oxide to increase by about 3.2% per year. Between 2005 and 2013, the Middle East has become one of the most important regions in regard to the global ethylene industry following a growth of 9.1% per year. Output is likely to rise by up to another 10 million tonnes between 2013 and 2021. After production had largely stagnated between 2005 and 2013, the US are significantly increasing output, capitalizing on cheap shale gas. Eastern Europe, dominated by development in Russia, and Africa are also expecting to see a high relative increase of production volume. Western Europe, on the other hand, will reduce output as a response to the increase pricing pressure. Chapter 1 is a description and analysis of the global market for ethylene. Development of demand, revenues, and production are explained in detail. Additionally, data on existing and future production capacity is provided. This report also offers an extensive insight into the development in individual countries and regions. Chapter 2 examines the 32 largest countries of the market in more detail and provides information on demand, revenues, production, import, and export of ethylene as well as capacities. Demand for ethylene in the production of high-density polyethylene (HDPE), linear low density polyethylene (LLDPE), low-density polyethylene (LDPE), ethylene oxide, ethylene dichloride (EDC), ethylbenzene, and other applications will be analyzed in detail. 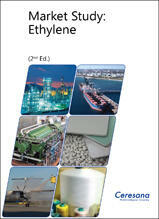 Chapter 3 provides a detailed analysis of applications of ethylene, e.g. its use in the manufacturing of high-density polyethylene (HDPE) and all other applications. This study contains data on demand development, split by Western Europe, Eastern Europe, North America, South America, Asia-Pacific, and the Middle East and Africa as well as consumption figures for individual countries in these regions. Chapter 4 is a useful directory of producers, clearly arranged according to contact details, turnover, profit, product range, production sites, profile summary, product-specific information as well as existing and future capacities at individual production sites. Extensive profiles of 119 manufacturers are given, including Braskem, Chevron Phillips, Dow Chemical, ExxonMobil, Formosa Plastics, LG Chem, LyondellBasell, NPC, NOVA Chemicals, Petrochina, PTT Global, Sabic, Shell and Sinopec.